Charlotte Napoléone Bonaparte (31 October 1802 – 2 March 1839) was the daughter of Joseph Bonaparte, the older brother of Emperor Napoleon I, and Julie Clary. Her mother was the sister of Désirée Clary, Napoleon's first love. Charlotte married her first cousin Napoleon Louis, the second son of Louis Bonaparte and Hortense de Beauharnais on 23 July 1826. She studied engraving and lithography in Paris with the artist Louis Léopold Robert, who is reputed to have fallen in love with her. After her father was deposed in 1813 he moved to America and purchased "Point Breeze", an estate on the Delaware River near Bordentown, New Jersey. His palatial house was filled with paintings and sculpture by such luminaries as Jacques-Louis David, Antonio Canova, Peter Paul Rubens, and Titian (Tiziano Vecelli). The surrounding park of 1,800 acres (7.3 km2) included landscaped gardens. Joseph Bonaparte played host to many of the national’s wealthiest and most cultivated citizens, and his art collection played a crucial role in transmitting high European taste to America. Charlotte, known as the Countess de Survilliers, lived with her father in New Jersey from December 1821 to August 1824. While there she sketched numerous landscapes including Passaic Falls, her father's "Point Breeze" estate, the town of Lebanon, New Jersey, and others, some of which were engraved for the book "Picturesque American Scenes" by Joubert. Extant landscape drawings by her include Passaic Falls, a view near Tuckerton, New Jersey, and Schooley's Mountain. She also painted portraits (Cora Monges, 1822; Emilie Lacoste, 1823) and exhibited her work at the Pennsylvania Academy of the Fine Arts. 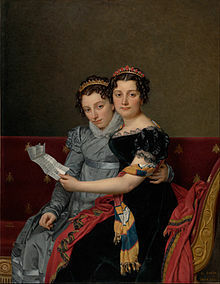 Charlotte, her sister Zénaide (1801–1854), and their mother were painted by the French artist François Gérard, while their mother was Queen of Spain. Another French artist, the well-known Jacques-Louis David, painted a portrait of the two sisters; it shows them reading a letter from Philadelphia sent by their father. Charlotte reportedly died in childbirth, aged 36. Her tomb is in the Basilica of Santa Croce, Florence, Italy, and it says (paraphrased): Born Oct. 31, 1802, died 1839. Wikimedia Commons has media related to Charlotte Napoléone Bonaparte. E. Benezit, Dictionnaire critique et documentaire des Peintres, Sculpteurs, Dessinateurs et Graveurs (1966), vol. 1, p. 754, and vol. 7, p. 279. Patricia Tyson Stroud, The Man Who Had Been King: The American Exile of Napoleon’s Brother Joseph (Philadelphia: University of Pennsylvania Press, 2005), pp. 88–113. William H. Gerdts, Painting and Sculpture in New Jersey (Princeton, NJ: Van Nostrand, 1964), p. 56.